Bill Salus: Let's move onto war number three — Revelation 6. What do we have going there, David? Dr. Reagan: A lot of people believe that when the Tribulation begins that the whole world will be so taken by the Antichrist because he will be such a dynamic, charismatic personality that the whole world will just bow down and start worshipping him. I don't believe that at all. I think that will be true in Europe. I think he will be seen as a great Savior. I think the Israeli's will look upon him as a political Savior, though not a spiritual one, just a political one. I think he will rise to power in Europe peacefully through his cunning and through his charismatic and dynamic leadership. But, I don't think the rest of the world is going to bow down immediately and accept him as a world leader. Africa and Asia and Latin America have spent 200 years getting out from underneath European dominance and they are not going to suddenly turn around and bow down to some European leader and say, "Come rule us." I think that he is going to have to conquer them. In Revelation 6 we see the beginnings of a great conventional war in the Tribulation period when the Antichrist is setting out to conquer the entire world. I believe the ones who will oppose him the most will be the remaining Muslims. I believe God will work through these wars to finish off Islam, and this will be the pouring out of God's wrath upon Islam. I think that the war will result in the destruction of many of these Islamic nations, but it is going to start out I believe as a conventional war. I think that is what we read about in Revelation 6. 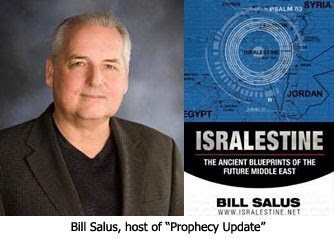 Bill Salus: What a platform the Antichrist will have to spread his lies about what happened to the Christians, because the world is going to wonder about the disappearances. To emerge on the backdrop of these wars using satanically fueled signs and lying wonders, this guy is indeed going to be recognized as the Antichrist by the Tribulation believers, not to mention the fact that somewhere in the mix we've got to have that false covenant signed (Daniel 9:27; Isa. 28). Another person wrote in yesterday asking pretty much the same thing - if Syria's wiped out by Psalm 83 and "the king of the North" is always a reference from Daniel that has been historically corroborated as Syria, then how can Syria be bothering Israel and the Antichrist later in the Tribulation. Very good question! I don't know, though, and can only speculate that as a vassel of Israel the ruler of Syria rebels at some point.